For volunteers age 55+ in Adams or east Arapahoe (Aurora, east Centennial, or I-70 to Deer Trail). Sponsors: Corp. for National and Community Svc., and Senior Hub. Studies say volunteers have longer/happier lives. E-mail/call trapp@seniorhub.org, or 303-426-4408 Ext 219 about these and others. Schools: Schools Where All Thrive (SWAT) Tutor/Mentors. Help 2nd and 3rd graders with reading in Adams 1 (Mapleton), Adams 12 Five Star, Westminster (Adams 50) or Brighton 27J elementary schools for 2hrs/week. Teams of 3-5 volunteers assist 4 students per volunteer. We need many more volunteers this Fall as we add additional schools and volunteer teams. Training is provided. 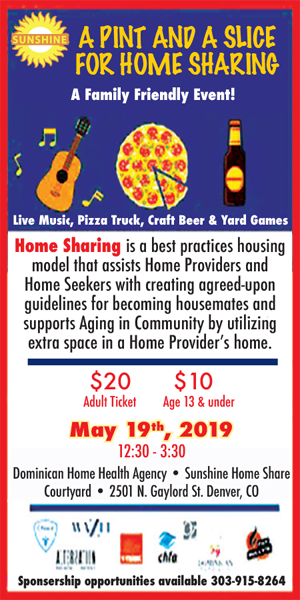 Contact Donna Rody, SWAT Program Coordinator at 303-426-4408 Ext 220, or drody@seniorhub.org. Other school help: Many other volunteer spots are available in several Adams/Arapahoe school districts doing activities other than the SWAT program. Call Tom Rapp at 303-426-4408 Ext. 219. Meals on Wheels (MOW): West Adams County, Aurora, Brighton. Deliver 1 day/week or more. Routes Mon – Sat take 1-2 hours. Many drivers are needed immediately. Help keep those who need these meals delivered to them off waiting lists because there aren’t enough drivers. Call RSVP today. Senior Hub In-Home Care Dept: Many volunteers are needed for east and north-metro areas to help homebound seniors with housekeeping, shopping, meals, companionship, caregiver respite. Call RSVP. Senior Hub: Adult Day Service Dept: Needs clerical and filing help, and volunteers to serve meals and help with activities one day per week Mon.-Fri. Call RSVP for contact information. Senior Peer Counselors: Seniors age 50+ to help serve as peer counselors. No experience is needed, we train! https://www.communityreachcenter.org/services/adult-and-senior-services/senior-reach/ . Contact Tom Rapp for more information. Hospital Help: Platte Valley Medical Center (Brighton) North Suburban Hospital (Thornton), Saint Anthony North (Westminster): Several different jobs. May require up to four-hour shifts. Call RSVP. Military vet or vet’s spouse/widow: DEERS/ID cards, TRICARE, SBP, the VA, retired pay, wills, powers of attorney, prescriptions, casualty assistance, military records questions or to volunteer, e-mail Buckley AFB Retiree Activities Office at RAO.Buckley@us.af.mil or call 720-847-6693. Aurora Health Access: Volunteers help in many ways: Serving on boards and committees; helping with filing and clerical tasks; answering phones; receptionist duties. Call RSVP. CASA (Court Appointed Special Advocates) Adams/Broomfield: Help children who can’t live safely at home to fight for safety, dignity and passage through the court system to foster care. Call RSVP. Arapahoe County Dept. of Human Services (DHS): Volunteers needed for administrative and program support, information ambassadors and helping with children during parent’s appointments. Vets Companionship Squads: Previous vets and/or vet spouses meet once a month to share meals and events together, assist at the Colorado Vets Home, and more. Call Tom Rapp for details. 6.Short-term 1-time events 7.Lap robe knitters ( We also need donations of four-ply, non-wool yarn).